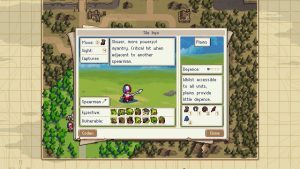 Wargroove’s campaign is split into various acts and stages involving a war across the land. When the king is murdered of one of the kingdoms, his daughter Mercia takes command and must save her people from an undead army. Each map is played out turn-based style, as you take turns leading your army against the AI. If you played the Advance Wars series, then the basic gameplay should feel right at home, but here’s a quick primer. Units are spawned at barracks set up on the map as long as you have the gold to field them. When a unit attacks, their health determines their overall attack strength, with the enemy getting a counter hit if they survive. Various terrain and weather effects can affect how battle plays out. Capturing villages will give you gold that can be spent at barracks to spawn new units. Each one of the game’s four factions has access to the same types of units, but they use different models. The pixel graphics are impressive during the combat phases. 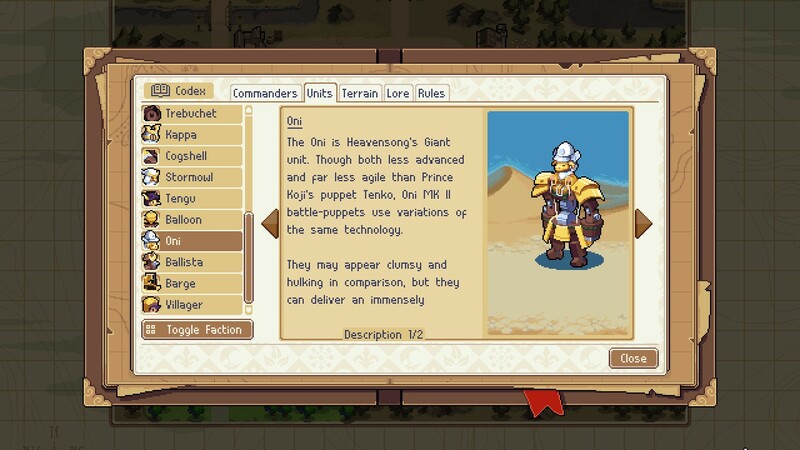 Where Wargroove goes in a different path is how commanders/generals are used, and the importance of critical hits. Unlike the Advance Wars series, maps will frequently allow you to play with a commander on the field. The commanders are the named characters that drive the story of the campaign. Each commander does massive damage to all units, recovers health per turn, and has one super power or “groove” that charges over time. Winning a map typically requires you to defeat the commander or take all the barracks over. As with Advance Wars and other turn-based strategy games, units belong to different classes that determine how effective they are at fighting each other. You’ll start with basic swordsman, but soon you’ll be fielding air, sea, and heavy units. 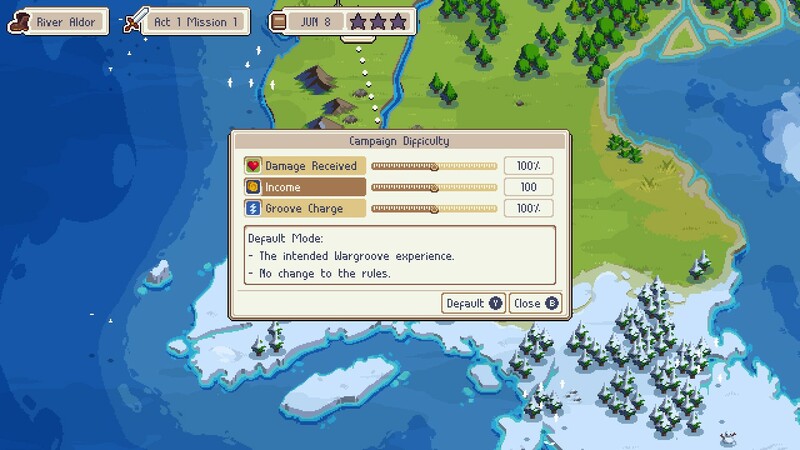 One new element Wargroove has that I like is the critical hit system. Typically in turn-based strategy games, the critical hit is often seen as a cheap mechanic — providing an unfair advantage based on RNG. Here, critical hits are controlled by the unit type itself. How it works is that every unit has a condition that they will pull off a critical hit — spearmen get it if there are two or more adjacent to each other as an example. This allows you to not only control how critical hits work, but set up deeper strategies with your army compositions. The game also features a complete map maker mode to allow players to create their own stages, multiplayer, bonus challenges, and more. All this sounds amazing and adds a lot of value, but my issues stem from the core gameplay loop itself. Wargroove has a lot going for it, but the gameplay feels like the weakest part of the game in my opinion. In order to streamline the learning curve, the four factions all feature identical units in terms of stats and classes; the only difference is in the character models. This is a huge blow not only to the depth of the game, but also a missed opportunity. Given how diverse and creative the unit designs are, I would have liked to see some asymmetrical differences to make things interesting. Even the commanders don’t offer that much in terms of different gameplay. 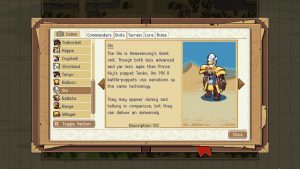 In Advance Wars, every commander not only got a special power (later games gave them 2), but they would also get a unique passive that affected the units under their command. 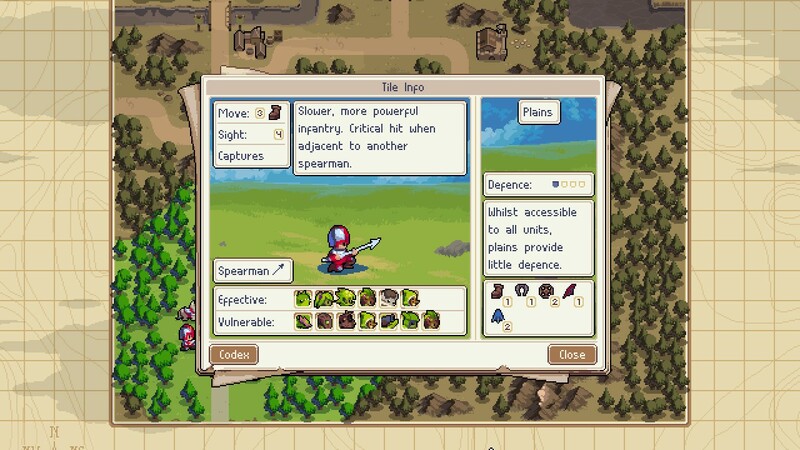 Wargroove once again goes for simplicity in this regard. While there is nothing wrong with keeping things simple, it does have an impact on the longevity of the game. You’ll soon realize that the campaign maps begin to feel repetitive due to the limitations in tactics. 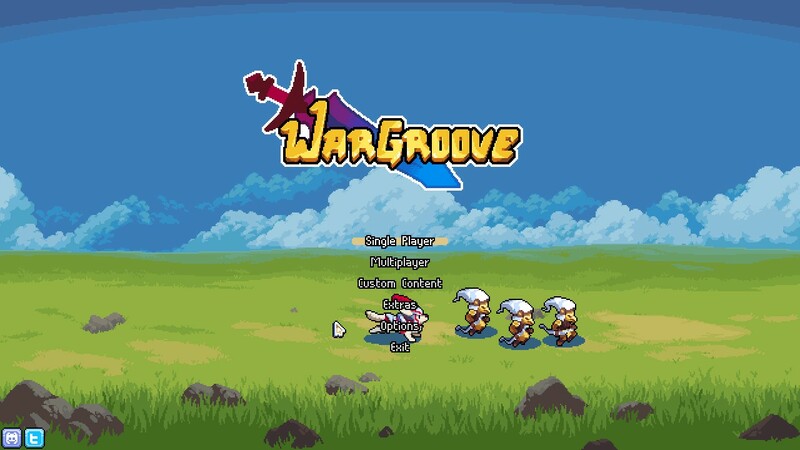 The only element that mixes things up is what makes Wargroove frustrating to play. As you get further into the game, you’ll run into more maps that feature event triggers designed to give the enemy an advantage. This can include spawning enemy units, changing the rules, and more; with the general idea is that they’re designed to make things harder for you. The problem with this mindset is that it makes every map harder than they should be for your first time through it. If you don’t know that enemies spawn or that they will attack at event X, it can leave you in a weakened position or outright lose the battle. Conversely, knowing that information and acting accordingly will make life a lot easier for you. This also factors in with several quality of life features that are lacking in Wargroove. The UI of the game is serviceable, but could use some tweaking in a few areas. There is no redo action, and it can be very easy to move a unit to the wrong spot or even end your turn without a prompt. Given how units of different types are stronger or weaker to one another, I would have liked an on-screen indicator to show me if the unit I’m using is getting a class advantage or disadvantage when fighting. While the game does have a “save upon exit” feature, there is no way to save or create checkpoints during a match. Even though this could be exploited, I would have liked some kind of mid-mission or event-related checkpoint. If you fail because of an event that you didn’t know about, your only choice is to repeat the entire map from the beginning. The game plays very slowly: Units have small movement ranges, combat animations take several seconds and are not easily skipped (unless you turn off all of them), and I didn’t see a “fast forward through enemy turn” option. Please note that the dev team has promised a quality of life patch to fix complaints fans have brought up, and there is a chance that these issues may not be in the current version of the game. Despite my complaints around Wargroove, this is still a worthwhile game to pick up for fans of strategy games. You can tell that the developers really put everything they wanted into this game, and that they are fans of the genre. With no new Advance Wars title in sight, Wargroove is a good fix if you’re in the mood for that kind of design or never had a chance to play it to begin with.